Eastern Virginia Medical School May 2010 Norfolk, VA M.D. After seven years of teaching middle and high school in California, Dr. Bauer decided to change careers and moved his family to Norfolk to become a physician. Dr. Bauer focuses mainly on medical dermatology and treats all dermatological conditions with an emphasis on skin cancer treatment as well as the surgical removal of benign and malignant skin lesions. "Dr. Bauer is a knowledgeable and kind dermatologist. Very pleased." "I have now been going to Pariser for a couple years due to a long term issue on my foot. At all times, I feel like I have been treated well, both as a person and a patient and have recommended Pariser to friends that needed this type of care." 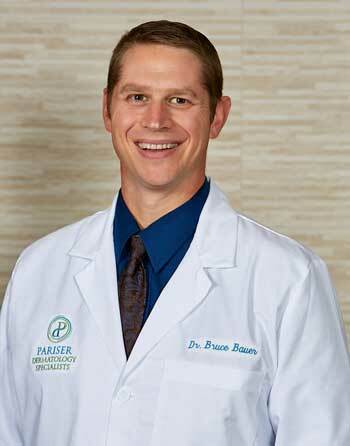 "Dr. Bauer addressed my concerns quickly, clearly, and thoroughly." "My son and I were going to a different Dermatology practice in VA Beach but their office seemed to overbook way too much. Pariser Dermatology is MUCH better in that area. Very much appreciated!!" "Dr. Bauer was absolutely incredible! He put my mind at ease and was just a great doctor. He was very nice and so amazing." "My experience at Pariser Dermatology was excellent. I felt comfortable at all times during my time there. Dr. Bauer was very thorough, competent and respectful of my concerns. I will definitely be a returning patient." "Great Doctor and a great staff. I felt like I was in very good hands." "Pariser Dermatology is an efficient and well run organization. Doctor Bauer and his staff are the best."